The fiber hdmi cable is designed for teh raditional copper cable can't carry real 4K signal over longer distances, our fiber High Speed HDMI 2.0 cable guarantees 18Gbps bandwidth to display 4K @ 60Hz HDR perfectly at Chroma Subsampling 4:4:4/ 4:2:2/ 4:2:0. 4K@60Hz and 32 audio channels,high definition images and high fidelity audio. Material: Hybrid Optical Cable with Fiber and Copper Wire. 4-core optical fiber. Low Signal loss for long distance transmission and High Resistance to External Interference. Support Accurate UHD Broadcast Made of 10bit Color Depth Transmission. PLEASE NOTE: The fiber optic HDMI Cable is single direction installation Only, It must be installed in the correct direction: "source" label on the HDMI end is connected to Blu-ray player, AVR, PS4, Xbox; "display" end is connected to your TV/projector. The fiber optic HDMI cable is better than traditional HDMI copper cable for long distance transmission at full 4K 60Hz, mostly raditional HDMI copper cable can not transfer 4K@60Hz 18Gbps over 30ft. 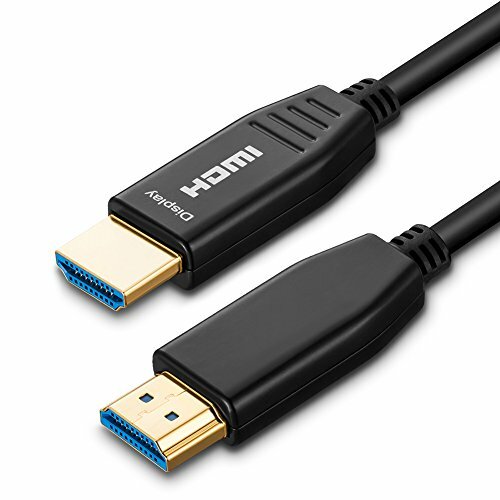 HDMI 2.0 4K cable transfer rate up to 18Gbps bandwidth to handle 4K@60Hz 4:4:4/4:2:2/4:2:0 up to 150ft without signal loss. Verify the SOURCE and DISPLAY port: SOURCE port must connecting the hdmi source(Blu-ray, video games,computer etc.) DISPLAY port must connecting the hdmi device(TV, cinema projector, etc.). Plug and play. Thin and flexible makes cabling easier for you, meets HDMI v2.0 testing specifications, supporting HDCP 2.2, CEC, EDID, 3D. Worry free. We are confidence by our products quality any problem please CONTACT US immediately, we will 100% to solve it. Any manufacturing defects will be new one free or full refund. If you have any questions about this product by ShineKee, contact us by completing and submitting the form below. If you are looking for a specif part number, please include it with your message.